Previously we have offered you the discount of 50% off. Now TheOneSpy offers you 30% off New Year Sale on our all premier packages. This offer includes surrounding sound recording, Camera bugging with front back Cam, Mic Bug voice recording, and all 16 popular Instant Messengers i.e. WhatsApp, Viber, Skype, Facebook Chat, Google Hangouts, IMO, Kik and much more. As we all know that we all like free things, so keep that in mind this offer which we are going to offer you is for the limited period. Hold your hearts and take a deep breath, we are offering you more than 130 features to 30% off. No one has more than 130 features in their product and never offered 30% percent off on all Premier features. We are very hopeful that you will admire our product’s Premier features. We guarantee you this package will save your time and money. If you have missed our previous offer than it is the golden chance to grab world’s most secure No.1 monitoring app with the great discount offer. Remember you will have everything to gain and nothing to lose; TheOneSpy has all the qualities what you need and wish. You just have to make the decision to choose your desired OS platform and pick up the desired package. Just click on the “By Now,” and then get the payment process. You will pay only 30% discount price. Further, you will receive a mail having a downloading link and account activation key as well. Install the App on your particular device and start using contemporary and power features. The 30% sale offer starts from 11 January to till 10th of February and get world most power full spy App in your hands. Previously we have offered you the discount of 50% off. 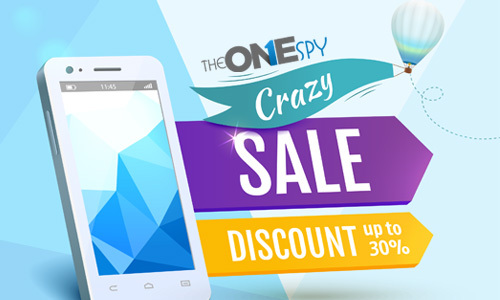 Now TheOneSpy offers you 30% off New Year Sale on our all premier packages. This offer includes surrounding sound recording, Camera bugging with front back Cam, Mic Bug voice recording, and all 16 popular Instant Messengers i.e. WhatsApp, Viber, Skype, Facebook Chat, Google Hangouts, IMO, Kik and much more.